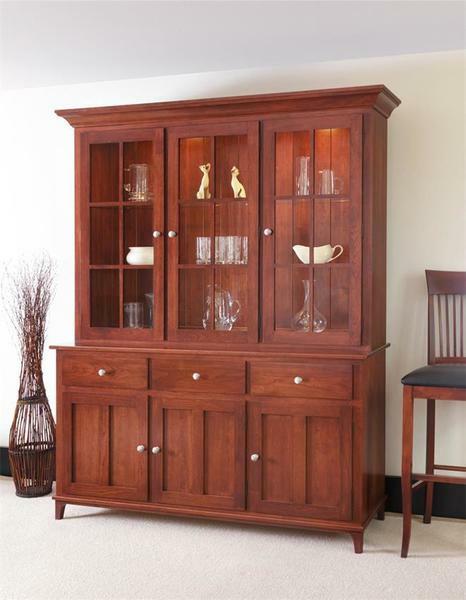 This hutch has a simple but solid form, along with gracefully scooped edges, creating an enduring and elegant appeal. Handcrafted by our talented Amish woodworkers, this beautiful hutch is handsomely designed, spacious, and crafted from beautiful solid oak or cherry wood for long-lasting enjoyment. This heirloom quality Amish Rydal Hutch is a fitting piece of display cabinetwork to accent your fine china and family treasures. Standard features of this solid wood hutch include attractive lighting that travels through the adjustable glass shelving providing a stunning presentation of the contents inside. The glass shelving also has plate grooves to display your decorative plates in style. This solid wood hutch has three glass display doors on the top, plus three cabinet doors and three drawers on the bottom, providing maximum storage of your dining essentials. The hutch top backing is a solid wood tongue & groove back panel with a plywood back panel on the bottom section to prevent warping from seasonal changes. Choose your wood, finish, and hardware type for a custom look that will match your personal style and become an accent piece in your home and family for generations. For additional information or custom ordering assistance on this beautiful shaker style hutch, contact one of our friendly and knowledgeable Amish furniture consultants.